There is something about travelling that brings with it an element of the mundane. I’m talking about that glazed eyes feeling one begins to emit after an hour or two in the car so that even when faced with the incredible beauty of a pass like the Piekenierskloof, which marks the entrance to the Cederberg and Olifants River Valley (isn’t it slightly freaky the way the river flows the wrong way? ), and which wends its way down to the town of Citrusdal, you remain slightly impervious. To call the Piekenierskloof Pass, which links Piketberg with Citrusdal on the N7, stunning is to do it a disservice. In reality it is a series of rather daunting twists and turns that overlook a patchwork quilt of multi-coloured farm fields, beautiful blue mountain ranges in the distance. In days gone by there weren’t any wheat fields down below one, and most of what you see would have been Renosterveld. It is the type of pass that makes you glad to be alive and which renews your passion for a country filled with breathtaking moments. It serves as the dividing line between the Swartland and the valley of the Olifants River, and must have been one mission to build. But our story begins on the crest of the Piekenierskloof Pass. At a place called Hebron. It comes highly recommended. It is well rated amongst those in the know. Which isn’t usually enough to promote a stop anywhere, but on this occasion we managed to find our way without any untoward impediment (a major achievement with a four-year old on the back seat) and there was enough peace and goodwill in the car not to prove something of a contagion to those we might meet at the stall. It didn’t take long with our snooping around the pretty area of the Hebron farm stall, called Tant Dollie after the old stall that was on the farm when they moved here, for Steve to come out to greet us. Steve and his wife, Caro (and their four children), live on Hebron – the farm stall, coffee shop and guesthouse. It’s actually a working farm too, and we stand chatting close to some macadamia nut trees, and seriously pretty buildings that make up the farm stall – the coffee shop and something that is in the throws of being built. A foreman sits taking a welcome break in the shade. This, we later learn, will be the new self-catering bungalow with views out over the Piekenierskloof Mountains. Steve is entertaining. We stopped intent only on sampling the wares of the stall, but we find that we remain far longer, swopping notes with the chef, baker, dad and entrepreneur who has managed to turn his mother-in-law’s farm into a wonderful country break at the top of a hill. Steve not only bakes his own bread, he also conjures up sausages, smoked chorizo and salamis, and the farms jams and marmalades from their own fruit. He comes to greet us in his apron – there is a huge vat thing to one side of the coffee shop stoep that testifies to major preserve production – but he says he has yet to use this gargantuan machine and must return it to the neighbour from whom it is borrowed. Steve gets to talking about the six guest rooms he has here, hidden around the corner of the coffee shop (which also has a lovely interior perfect for colder days, decorated with a few nooks and crannies filled with wooden tables and chairs) and cuts us a slip from the macadamia nut tree – we’re hoping it will grow back in Cape Town; wishful thinking, no doubt. 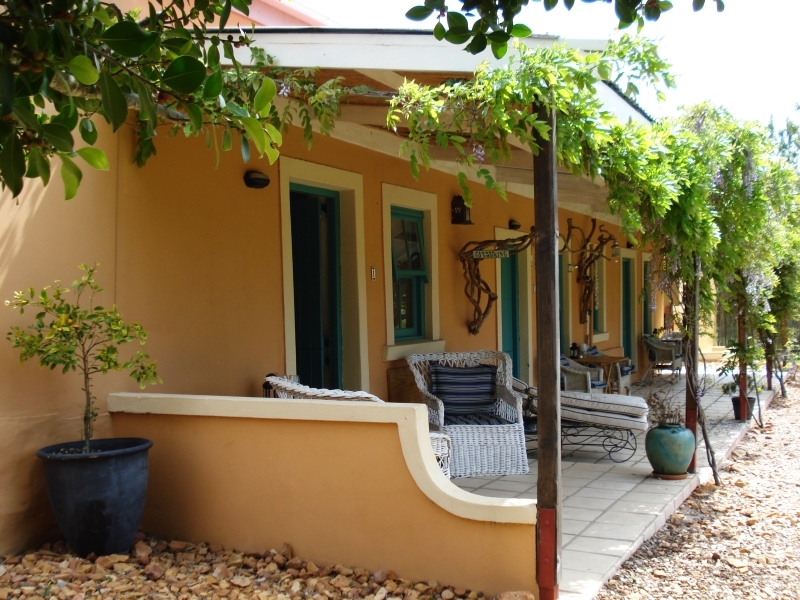 I take a wander round the back to sneak a look a that the rooms around the pretty verandah, dripping in what looks like young wisteria vines, three of which overlook the Sneeuberg Mountain and Citrusdal valley. The other three rooms share a lovely secluded courtyard, the shade of which is provided by fig trees. And there’s a swimming pool out front, complete with deck and loungers. There is more than a suggestion of the other Hebron that nestles on the southern West Bank of Jerusalem here, and I now understand the reason for the name. One of the rooms is self-catering, and room six, which is detached from the main building, not only features its own free-standing Victorian bath but also makes for a wonderful honeymoon suite; Hebron provides a ‘honeymoon service’ for the room – think roses, champagne, candles and chocolates. My son has now taken a serious shine to Steve’s daughter, Emily, who has wandered away from her brothers and sister to see what is keeping dad – there are important things for him to do, like keep the peace whilst the boys fight over tadpoles, and swing her upside down. It is time to leave. We’re on the road to Paternoster, and Steve quickly outlines an alternative and certainly prettier route via Eendekuil and the R365. Just as well as the N7 appears to have a series of road works just past the turn off to Eendekuil – ah, the satisfaction of knowing you have plan B ahead of the game. But before we pile into the car, Steve nips into the farm stall and brings us a bottle of mebos to sample, on the house. It’s our first attempt at this specialty and we later enjoy it thoroughly with bread and cheese.